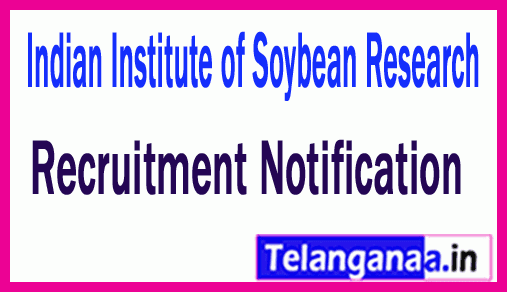 For the participation of 11 vacancies of the Indian Institute of Soybean Research Young Professional, looking for results oriented and skilled job seekers. Recently, Indian Soybean Research has announced a latest Career advertisement in the form of IISR Recruitment. To complete this recruitment process, job applicants joining the government sector can participate in Walker interview at the given place on December 7, 2018. Job seekers can get the rest of the information about IISR recruitment 2018 from this page, which is well designed by the experts and committed team members of www.telanganaa.in. Eligibility: Those candidates have the minimum qualification because the candidates who are willing to apply for IISR jobs, they apply undergraduate degree (Agricultural Science) / Diploma (CS / Engineering) / Postgraduate Degree (Computer Science) from any recognized institution. Should be there. The applicants should be between 21 and 45 years of age from 21-12-2018. Pay Scale: Following the qualification of the selection process, the contestant receiving the shortlist will be given Rs. 15,000 / - (post 1), Rs. According to organization norms 25,000 / - (post 2). Candidates' engagement will be based on their performance in written examination / interview, which will be conducted by the recruitment committee of Indian Soybean Research Institute. Candidates who wish to apply for IISR vacancies will have to go through the official website of http://www.iisrindore.icar.gov.in. After reading the full instructions, the claimants need to participate in the walker interview with the application in all courtesy at the address given below. Date for Walk-In interview: 07-12-2018. Qualification-Postgraduation M.Sc. In the following basic sciences: Biotechnology / Biochemistry / Genomics / Plant Molecular Biology and Biotechnology / Molecular Breeding / Genetic Engineering / Life Sciences / related basic sciences or M.Sc. (Agriculture with specialization in genetics and plant breeding) or M.Tech. Biotechnology. Emolument- Rs.25.000 / - + HRA. Location- ICAR - Indian Institute of Soybean Research, Khandwa Road, Indore - 452001.